Blepharitis is a common and persistent inflammation of the eyelids. Symptoms include irritation, itching, and occasionally, a red eye. This condition frequently occurs in people who have a tendency towards oily skin, dandruff, or dry eyes. Blepharitis can begin in early childhood, producing granulated eyelids, and continue throughout life as a chronic condition, or develop later in life. Bacteria reside on the surface of everyone’s skin, but in certain individuals they thrive in the skin at the base of the eye-lashes. 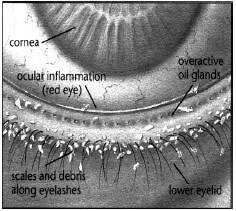 The resulting irritation, some-times associated with overactivity of the nearby oil glands, causes dandruff-like scales and particles to form along the lashes and eyelid margins. For some people the scales or bacteria associated with blepharitis produce only minor irritation and itching, but in others they may cause redness, stinging or burning. Some people may develop an allergy to the scales or to the bacteria which surround them. This can lead to a more serious complication, inflammation of the eye tissues, particularly the cornea (the clear “front window” of the eye). Chronic, low-grade inflammation can be associated with dryness, especially in older people. In blepharitis, both upper and lower eyelids become coated with oily debris and bacteria near the base of the eyelashes. The eye feels irritated and may become inflamed. Regular, thorough cleansing of the lid margin helps control blepharitis. lump in an eyelid oil gland. Mix one half water and one half baby shampoo in a cup. Use a Qtip and gently scrub the base of the eyelashes about 15 seconds per lid. Steroids may be used short-term to decrease inflammation. Antibiotics may be used to decrease the bacterial content of the eyelids. If the inflammation is severe, sometimes long-term tetracycline (by mouth) is used, especially for people who have a skin condition called rosacea. Medications alone are not sufficient; the application of warmth and daily detailed cleansing of the lashes is the key to controlling blepharitis. Eye disease can occur at any age. Many eye diseases do not cause symptoms until after damage has occurred. Since most blindness is preventable if diagnosed and treated early, regular medical examinations by an ophthalmologist are very important.